Effingham Buckley Morris was born in Philadelphia in 1856, the son of Israel Wistar Morris and Annis Morris Buckley. A member of one of Philadelphia’s oldest and most influential families, he was educated at the Classical Academy of Dr. John W. Faires before matriculating at the University of Pennsylvania as a member of the Class of 1875. Morris graduated with a Bachelor of Arts degree in 1875 and earned both his master’s and law degree three years later. He began his legal career as an attorney with P. Pemberton Morris and soon became general attorney of the Lehigh Valley Railroad Company and counsel of the Girard Trust Company. 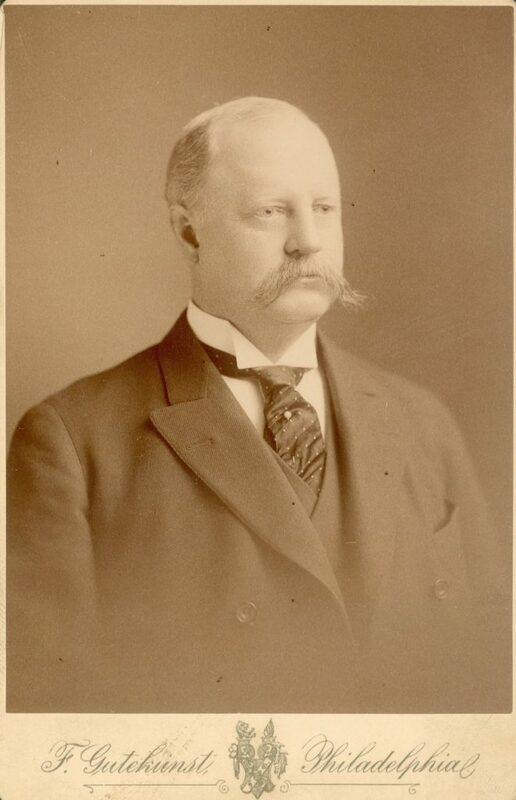 Seven years after his graduation from college, in 1882, Morris was one of the Penn alumni instrumental in the transformation of the Penn Athletic Association from a student association into a corporation made up of alumni and students; Morris served as the first secretary of this organization. In 1887 Morris was elected president of the Girard Trust Company. During his forty-one year tenure as president, the Girard Trust Company’s assets would grow to an unheralded size. Morris’ success here led to his selection as the youngest director of the Pennsylvania Railroad and to his status as one of Philadelphia’s most successful financiers. Morris also served as chairman of the executive committee of the Cambria Steel Co., and as director of the Philadelphia National Bank, Franklin National Bank, and the Commercial Trust Company. In addition, Morris played substantial roles in the managing of the Pennsylvania-Maryland Coal Co., Spanish American Iron Co., Maryland Steel Co., and the Philadelphia Fund Society, to name a few, throughout his distinguished career. While most of his life was focused around his financial career, Morris found many other ways to serve his fellow Philadelphians. Morris acted as the treasurer of the Pennsylvania Council of National Defense during the First World War and was made chairman of the executive committee of the Welfare Federation in 1922. He was also chairman of the American Peace Award Committee in Philadelphia, which offered a substantial award for a plan for world peace. Morris was president of the Chestnut Hill Riding and Driving Club as well as of the Academy of Natural Sciences. As president of the Board of Managers for the Wistar Institute, he donated a 150-acre farm to it in order to help the institute further its research in plant and animal life. He served as a trustee for University of Pennsylvania from 1911 until 1921, receiving an honorary degree from the University in 1928. He was always a generous benefactor of the University, culminating with the 1938 donation by his heirs of his Bolton Farm in Bucks County for the benefit of Penn’s Veterinary School. The University used proceeds from the sale of this property to buy more extensive acreage in Chester County where it erected the New Bolton facility of Penn’s Veterinary School. Effingham Buckley Morris married Ellen Douglas Burroughs in 1879. He died on January 22, 1937, leaving behind a legacy of prosperity and philanthropy the likes of which many have aspired to equal.